Bishop-elect Andrew Cozzens, center, reacts when Archbishop John Nienstedt announces his appointment as auxiliary bishop in the Archdiocese of St. Paul and Minneapolis during 7:30 a.m. Mass at the Cathedral of St. Paul Oct. 11. With the bishop-elect are Msgr. Aloysius Callaghan, left, rector of the St.Paul Seminary, and Father John Ubel, right, rector of the Cathedral. Dave Hrbacek/TheCatholic Spirit. Father Andrew Cozzens, an assistant professor of sacramental theology at the St. Paul Seminary, has been named by Pope Francis as an auxiliary bishop of St. Paul and Minneapolis. 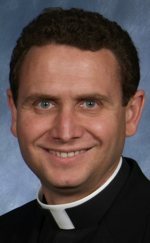 Bishop-elect Cozzens, 45, is a priest of the archdiocese, ordained in 1997. His episcopal ordination will be at the Cathedral of St. Paul on Dec. 9, which this year is the Feast of the Immaculate Conception of the Blessed Virgin Mary. The feast day holds special significance for the bishop-elect. “I have a great devotion to Our Lady, so I’m very grateful for her intercession and prayers, and the opportunity to be ordained on her feast day is really a great thing,” he said. Bishop-elect Cozzens said that, as a priest, he has enjoyed preaching, teaching, celebrating the sacraments and doing spiritual direction. As a bishop, he will continue with those ministries, “but on a larger scale,” he said. And he wants to promote the Church’s healing mission. “I’m a firm believer that Jesus wants to heal,” he said. “I’ve been very impressed with Pope Francis’ image that the Church is like a field hospital. We’re living in a world in which there are many hurting people. I just hope my ministry as a bishop will be part of the healing that flows from the heart of Jesus for people. Bishop-elect Cozzens said he received a call on the Feast of St. Therese – Oct. 1 – from Archbishop Carlo Maria Vigano, apostolic nuncio to the United States. A native of Denver, Bishop-elect Cozzens is the youngest of three children. He graduated from Benedictine College in Atchison, Kan., where he experienced a deepening of the faith through the Catholic Charismatic Renewal. During a period of discernment after college, Cozzens served as a travelling missionary to young people around the country with Twin Cities-based NET Ministries. He then joined the Companions of Christ in St. Paul and worked for St. Paul’s Outreach leading college Bible study groups. After his year of discernment, he was accepted into the St. Paul Seminary. Four years later, in 1997, he was ordained to the priesthood for the archdiocese. He served as parochial vicar at the Cathedral of St. Paul and then Faribault Catholic Community (now Divine Mercy parish) before being sent to Rome for doctoral studies. Upon his return to Minnesota, he began service as an instructor at the St. Paul Seminary. He said his experience with NET Ministries and SPO made important contributions to his vocation. “I’ve always tried to live my priesthood in an evangelistic way — that is, being attentive to making the Gospel attractive so that people can come to see and understand its power,” Bishop-elect Cozzens said. “But also reaching out to those people who are not currently connected to the Church and don’t know the love of Jesus. So I’ve always tried to do that. “I’ve always thought it important that a priest and a bishop have an evangelistic heart,” he said. Bishop-elect Cozzens is fluent in Spanish, having studied the language in Mexico before serving from 2000 to 2002 as parochial vicar at the Faribault Catholic Community. “I love working with Hispanic people. I love Hispanic ministry,” said Bishop-elect Cozzens, who used his Spanish skills every day for Masses and the sacraments. Until his episcopal ordination, Bishop-elect Cozzens will continue to teach at the seminary. Present at the Mass announcing his new appointment were Bishop Lee Piché, also an auxiliary of St. Paul and Minneapolis; Msgr. Aloysius Callaghan, rector of the St. Paul Seminary, and Father John Ubel, rector of the Cathedral. Family members of Bishop-elect Cozzens were also present, including his mother Judy and father Jack. 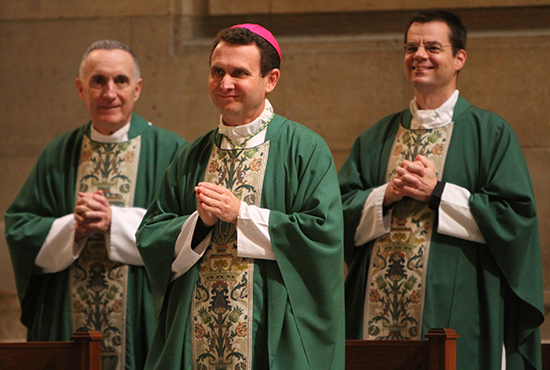 Read more about Bishop-elect Cozzens in today’s statement posted on the Archdiocesan website. Watch a video: How is rock climbing like our relationship with God? Trust is essential. This and more from Bishop-elect Andrew Cozzens as he shows Minnesota native and radio show host/author Lino Rulli, a nervous novice at rock climbing, how to repel down a cliff.